Tomatoes are happy to grow every which way, rightside up, upside down, left and right. So why bother to put complicated and potentially expensive support structures in place to prop them up? To understand why, you need to know that a tomato plant’s needs and your needs as a tomato-eater are not the same The plant “needs” to grow to maturity, set fruit and reproduce via the seeds of fallen, decayed fruit. All these things can be achieved without any support structure. Your needs, however, are to harvest those fruit before they become one with the earth . 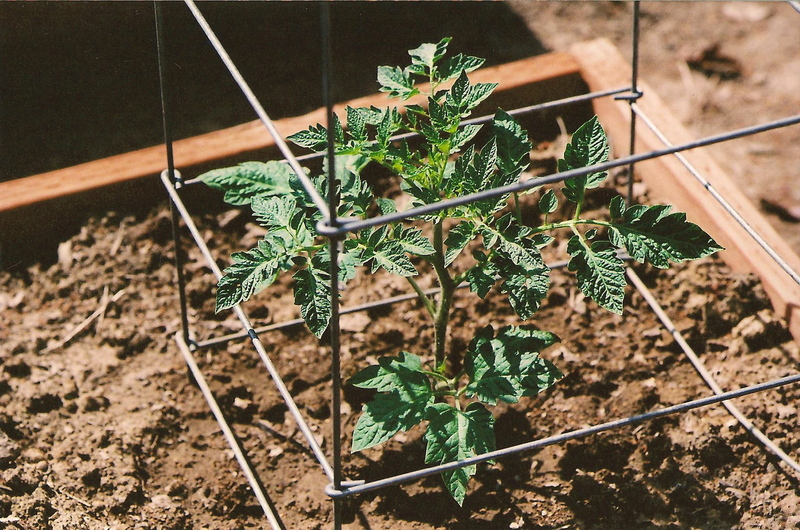 Support structures such as cages and trellises allow you to maximize your harvest by keeping the plants and fruit off the ground. The photos below will give you some ideas about some of the different ways you can support your plants and achieve true tomato transcendence this season. Use whatever stakes you have on hand – wooden stakes, bamboo, metal – just be sure that they’re at least 4 feet high. This isn’t the easiest method because you need to keep tieing the plant up over the course of the season, but it works and is cheap. 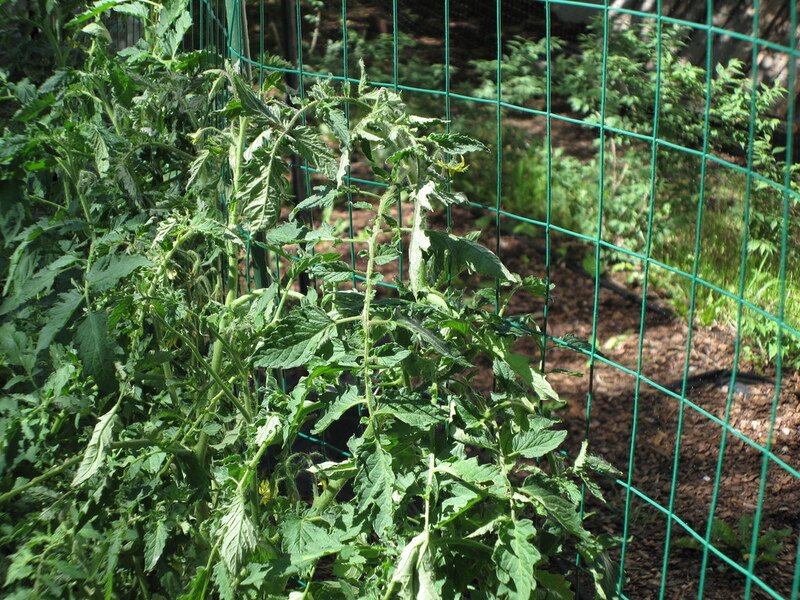 If you already have a fence structure in your garden, you can use it for supporting tomatoes or other vining crops. If you don’t have one, you can buy some lightweight wire fencing as pictured below. These cone-shaped cages are cheap and easy to find, but can topple easily when the plants start to grow top-heavy with foliage and fruit. You’re best off securing them with a heavy stake driven at least a foot deep into the soil. 4) Cage them – maximum security edition! There are cages and then there are cages. These heavy-duty square-shaped cages (also known as tomato towers) are secure and roomy but come at a price, usually about $25 each. They will, however, hold up for many years and allow for carefree growing. No tucking or tieing needed, aside from tucking into your wallet, that is. If you’re a do-it-yourselfer, you might also want to consider building your own sturdy cages. 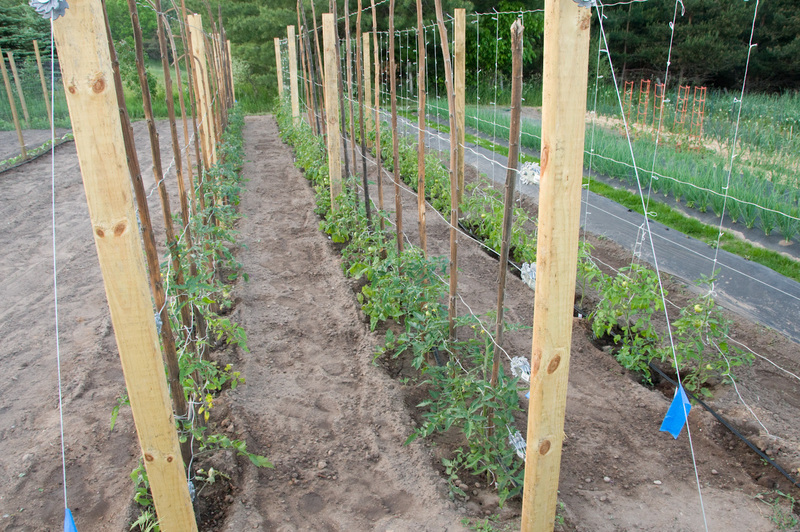 Farmers and advanced gardeners often train their tomatoes to a single vine to achieve maximum production rates. The support structures for type of cultivation can be costly in terms of money and time, but can pay off at harvest time. 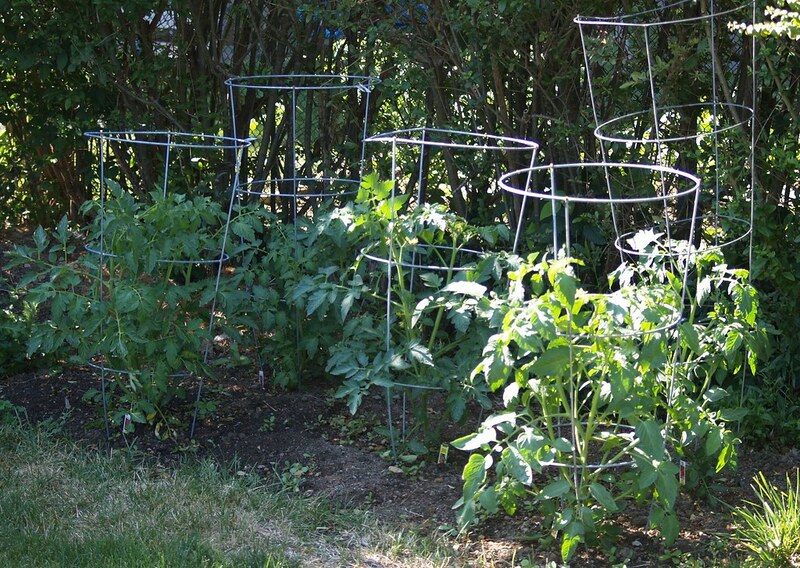 In the system below, the plants are supported both vertically by the wooden stakes and horizontally by the twine connecting the stakes.